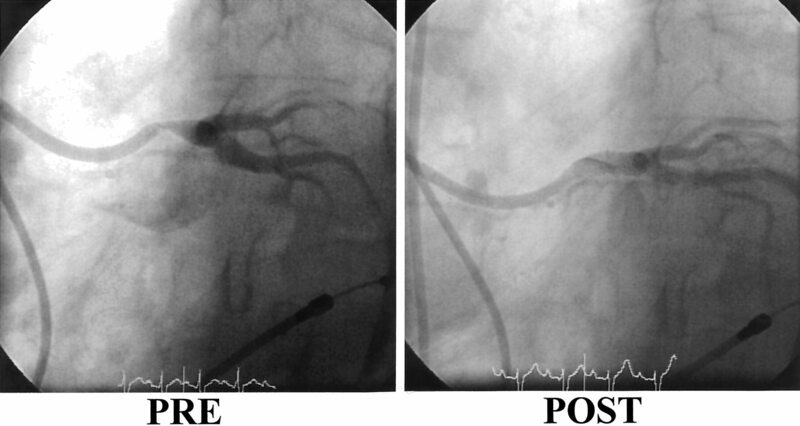 Sometimes, physicians can also treat a problem during an angiogram. For instance, your physician may be able to dissolve a clot that he or she discovers during the test. A physician may also perform an angioplasty and stinting procedure to clear blocked arteries during an angiogram, depending on the location and extent of the blockage. An angiogram can also help your physician plan operations to repair the arteries for more extensive problems. Your physician will perform blood tests to determine your blood’s ability to clot and to assess your kidney function. Based on the test results, the nature of the particular angiogram, and your particular situation, your physician may instruct you to stop taking aspirin or other drugs that prevent clotting. Your physician will also tell you which medications you should continue to take. Usually, your physician will ask you not to eat or drink anything within 6 hours of your angiogram. Depending on your particular situation, however, you may be encouraged to take extra fluid before an angiogram. Sometimes this fluid will be given to you by intravenous administration. Also, if you have problems with your kidney functions, you may benefit from medication given to you before the test as well as the extra fluid administration. If you have allergies to the contrast material or to iodine or shellfish, you may require medication before the test to lessen your risk for an allergic reaction. Your vascular surgeon will advise you regarding the best treatment options for your particular situation. Since you shouldn’t drive immediately after an angiogram, you should arrange for a ride home. Your test will take place in a room equipped with a specialized x-ray machine. Your physician will insert an IV to provide you with fluids and medications. Your physician will choose where to insert the angiographic catheter, usually into an artery in your groin or near your elbow. Before the insertion, he or she will clean your skin and shave any hair in the area to reduce your risk of infection. Your physician will then numb your skin with a local anesthetic and will make a tiny puncture to reach the artery below. He or she will then puncture your artery with a hollow needle, advance a thin wire through the needle, thread a catheter over the wire, and guide it to the desired location. Your physician will use x-rays that are projected on a video screen, a process called fluoroscopy, to see the catheter as it moves through your arteries. Usually, he or she will move the x-ray table to follow the catheter as it is moved through your blood vessel. Once your physician has positioned the catheter properly, he or she will inject the contrast dye. The contrast causes a brief, mild warm feeling as it enters your bloodstream. Your physician will take more x-ray images to see how the contrast is flowing through your arteries. During the test, your physician may ask you to hold your breath for about 5 to 15 seconds. In addition, your physician may ask you to lie perfectly still to prevent sudden movements from blurring the x-ray pictures. Complications from angiography may include bleeding, pain, or swelling where the catheter was inserted, or pain, numbness, or coolness in your arm or leg. These symptoms may signify either bleeding from the puncture site or blockage of your artery. Bruising at the puncture site is common and usually resolves on its own. Rarely, impaired kidney function, or kidney failure, can occur following an angiogram, especially if you already have kidney disease. Also rarely, severe allergic reactions can occur, especially among people who have had previous allergic reactions to the contrast dye. Infrequently, a patient may experience shortness of breath or fluid overload if they have a heart condition associated with poor pumping action, such as congestive heart failure.